As far as music games go, there very few things you can do at this point. Games like Rock Band, Guitar Hero, Tap Tap Revolution, and many others have notably squeezed close to everything out of the genre, or so I thought. Reflec Beat Plus introduces some neat ideas that are surprisingly refreshing, even if it doesn’t exactly stick the landing. 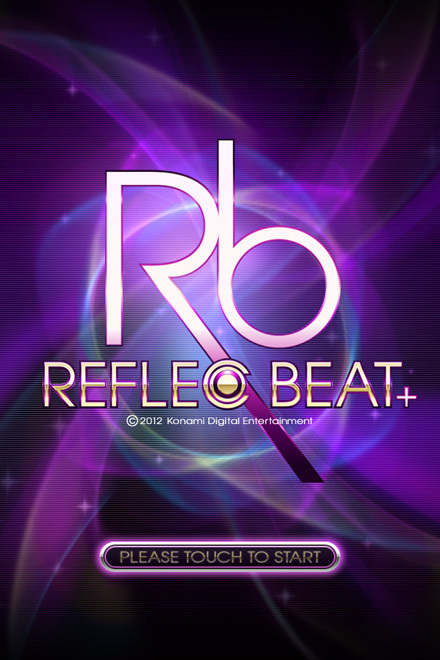 Reflec Beat Plus: Any good? Reflec Beat is most decidedly a game made either in Japan, or by people with Japanese game design mentalities, and it’s something you notice as soon as you boot up the game (assuming you didn’t already notice the Konami logo). As soon as you load it up, you’re greeted by chill Japanese lounge music, followed by a young woman’s echoic voice saying, “Reflec Beat Plus” when the main menu appears. 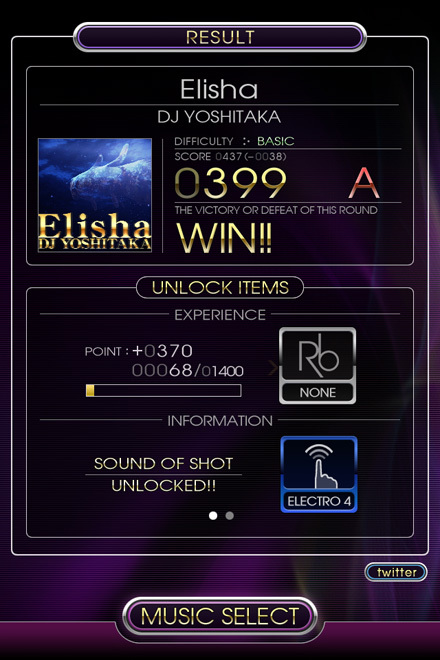 Her sultry voice shows up every time you press a button, and at the end of the match to tell you how you did. I’m a little guilty to say I enjoyed it more than the game intended me to. 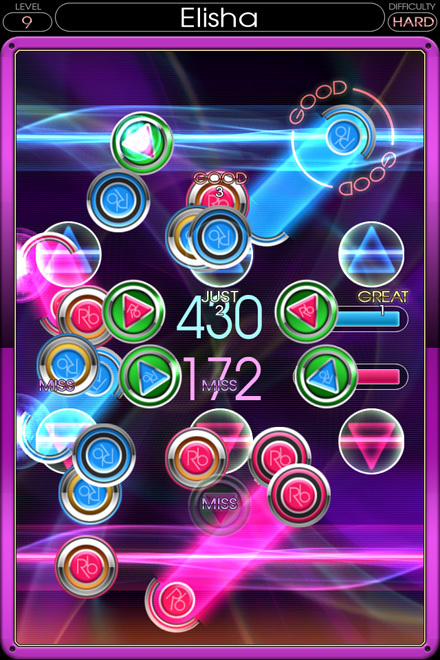 Reflect Beat’s main concept is tossing notes back and forth, air hockey style, and whoever hits the most notes wins. Some notes you have to hold, others you have to hit simultaneously. It really is a cool notion when you think about it. Unfortunately, the idea trips over its feet when you get into the harder difficulties. Now, this isn’t a matter of skill, like in Rock Band or Guitar Hero where practice is the answer. There become so many note “pucks” on screen that are moving in different directions, overlapping, and bouncing off the walls that you literally cannot process what notes you have to hold, what you have to hit at the same time as another note, and what notes you have to hit while in the designated areas other than the colorful bar at the bottom of the screen. Sound confusing? I couldn’t imagine being color blind and having to decipher what’s going on. You play against an AI, which goes from rolling over and dying in the beginner modes to absolutely mopping up on higher difficulties (I’m also not sure it can “sort of” hit notes; it either nails it or misses completely). There currently is no way to play against other people, both online and off; it’s all just high scores, which is a shame. As you progress in the game, you level up and unlock various things, including the sound the note makes when tapped, the background menu music, the explosion the notes make after they’ve been tapped, the color of the frame that the gameplay takes place in, and the background image of the main menu. There are three songs included, and there are two Konami music packs in the Reflec Beat Store, each for four dollars with four songs in them. As it stands, there is no way to unlock more songs other than with your credit card. I must stress that these are all Japanese songs. There’s nothing wrong with this, but if you were hoping to jam out to Katy Perry, DJ Tiesto, or what have you, you may be disappointed. Personally, I feel like I’m playing a mini-game in a Final Fantasy or Persona game. The music itself is well-made and fun to listen to, what little there is in the free version. Eight dollars is a steep proposition for a phone game with eleven songs. 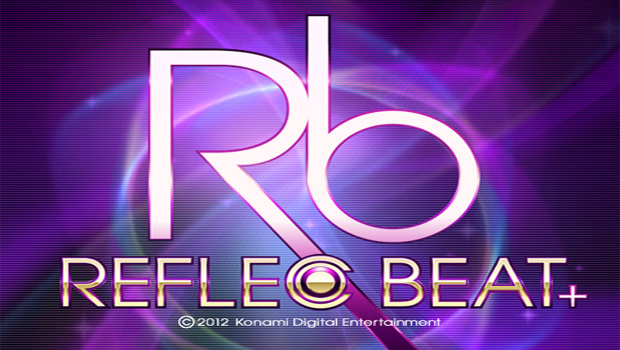 Reflec Beat Plus is a game structured around a good idea, except more thought was required the bigger the project got. A game should be progressively harder, but still manageable. If you’re going to make a music game in this market, you’re going to want a lot more than eleven playable songs; this is something I hope Konami tackles and expands on in the near future. At the end of the day, the foundation this game, Reflec Beat Plus, rests upon is solid, but what’s built on top is still in danger toppling over. I’m a little saddened by this review. I am a huge music/rhythm game fan, and giving this game bad rep over its difficulty is complete nonsense. Now it is unfortunate that you played this on the iPhone/itouch since this game shines brilliantly on the iPad (which is what I am playing it on). The game can get a bit cluttered on the mobile devices, but if you gave it a shot on the tablet versions, I’m pretty sure you will reconsider the rating you gave the game. Now, this game has been released in japan for some time now (iOS), and I own both the international and the Japanese version of the game, and they have well over 100 songs to purchase. The game just hit the US App Store, so it is quite obvious there won’t be that many songs due to localization in licenses for the songs. While konami has been really slow on adding songs to the store itself (especially on jukebeat), at least they decided to cater to the western side. Not sure if you have checked the prices on the dlc for flex beat plus, but its about 5.99 per pack. Very pricey, and I have probably spent well over $200 on both jukebeat and reflec beat plus. The game actually does offer multiplayer btw, there is an option known as “double play” under every song, you can adjust the difficulty of the Ai as well. Double play allows two people to play on one tablet. It is a very neat feature. Now I understand this is your opinion of the game, but you have to consider opinions can’t meddle when doing a review. You have to credit the cons and pros of the game itself. Not degrade the game because it lacks what you want. Thanks for the review! Was about to download it but I think it would be a waste of time !